Why no dog is ever too old to learn a new trick. I am an older gentleman...that’s pretty obvious when you look at me. The 40 and more years I’ve spent in business and sales are pretty evident, I guess, but what makes me still viable in business is not my outward looks. It’s the knowledge I have, and have gained through continuous learning. That’s not boastful, but it does explain how anyone who wants to stay on top of their game at any age can do so: Never Stop Learning. Of course, no one likes a know-it-all. That’s not what we’re talking about here. What continuous learning does instead is make you a RESOURCE. You demonstrate your knowledge — not in offering it when it isn’t asked for, but in situations where people are looking for an answer and you can lead them to it. Have you ever tried tackling a problem, and perhaps you’re at your wit’s end, and you connect with someone who can help explain how to solve it? I would bet you kept their name, or in this day and age, bookmarked their webpage. They became a resource, a valuable go-to when you needed to know something. 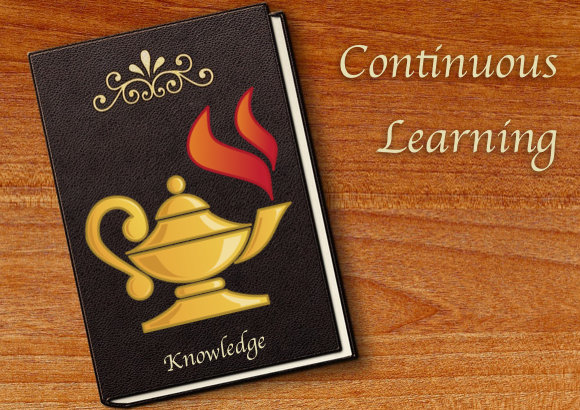 So what are the characteristics of continuous learning? People shouldn’t wait for an issue to arise to learn about it. If you’re really engaged in your business, you are looking ahead, and taking the steps to get educated on what’s ahead without being told to. Let’s face it, when a crisis arises, you don’t have time to do a whole lot of research. In fact, you’re probably looking for that person (that should have been you) to answer your questions, quickly. Spend at least 15 minutes each day looking through your resources — industry publications, perhaps thought leaders who post regularly on social media — in order to stay up to speed on what’s happening that can impact your business today and in the future. If there are new tools, invest the time to learn them. Nothing is more embarrassing that having a client have to explain something to you that you should have known about already. Conversely, nothing impresses a client more than showing them a product or process that can improve their company. Like that “answer man” you kept the name for, you better believe they will call on you when other issues arrive. Your value is priceless to them. Pay attention to your attitude when you’re learning. Is it exciting? Do you have an “Oh, wow!” moment, and keep digging for more information? Or do you treat it like another task, find any answer and then move on? 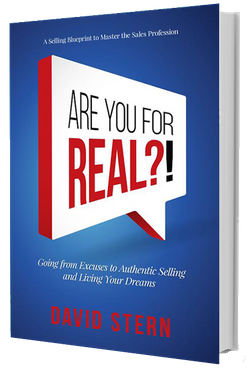 Just as my book is called “Are You For Real?” this is something you can’t fake. People know when you’re really not interested in something, no matter how much you feign interest. However, you can look deeper, and ask yourself how you can change your attitude. Imagine learning as a rung in a ladder. If it’s missing, you can’t step higher, and if you can’t step higher, someone else on the ladder next to you might just pass you up. Keep your goals in front of you (you have written your goals down, right? ), and you’ll see very clearly how learning is a vital part of them. As kids we always wanted to know how things worked. We took things apart, perhaps not being able to put it back together, but the process was exciting and it fed our curiosity. Somehow, as we got older, perhaps we got a little lazy, and felt that it wasn’t worth the effort to learn more. After all, we got a diploma and a degree...isn’t that enough? Curiosity is the fire that feeds our learning. Tap into it - perhaps make a game of it. Pose a question and see how quickly you can get to the answer. And truthfully, the internet makes it so much easier to tap into topics that you have questions on. When you get to an answer, celebrate it. Over time, you may find it becoming second nature, where you ask yourself questions about, well, anything, and you can’t wait to get to the answer. I think formal education has taken the fun out of learning as well, so don’t view it as a classroom assignment that will be graded. Instead, think of that inner kid in you that had to figure something out — and relish in finding the answer. We are all creatures of habit. We love our comfort zones. The continuous learner however, bucks tradition and seeks assignments that deliberately places him in new situations, where learning is simply unavoidable. Ask yourself if you’ve always sought out similar industries to work in (not that experience is a bad thing), or if you have looked for new frontiers to learn about, taking the skills you’ve gathered to apply to the new situation? Truly nothing makes you more keen to learn than knowing you’re not the smartest person in the room. It forces you to research, seek experts, and read, read, read up. It’s uncomfortable, but there is no feeling like an “Aha!” moment, where you finally “get it.” It’s empowering. Now, take that feeling and use it to motivate yourself to learn something else. Step by step, you’re becoming a master in an area you previously had no experience in. The new confidence that going through this process brings has the effect of boosting your personal interactions, and making you more successful in dealing with coworkers and clients. Overall, it’s an irony that many people may seem fearful of learning new things, of stepping out of their comfort zone. Instead, it’s that process of continuous learning that helps you overcome fear. The more you practice it, the easier it becomes to tackle new challenges, and the more confidence you build. From the perspective of the people who do business with you, it also helps increase your value.